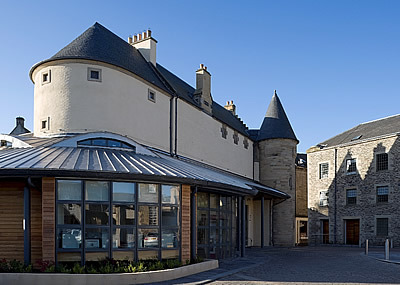 The quality of the Heritage Hub and its programmes is widely recognised in partnerships with the National Records of Scotland, Historic Scotland, RCAHMS, The Registration Service and others. Since 2013 the Hub has been part of the Scotland’s People Centre network, offering the national genealogy resource five or more days per week. The Heritage Hub provides a range of online resources for family and local history and supports schools’ curriculum activities and remote use; historical blogs; an image bank; source lists for further research and more recently contributions through social media. Hubcat – the online catalogue of the Archives collection will continue to expand in scope and depth. The Hub team take their services into local communities and work with schools, community groups and individuals to allow further access. Since 2007 the Heritage Hub been the home for the Council’s Archive and Local History Service with the key archives and records held by the Council in purpose built storage meeting PD54:54, the UK Standard for Archive Storage. The archive collections continue to expand in scale and diversity. These collections include Council records and play a part of the Council’s Data Protection and Freedom of Information responsibilities, and support Legal and Social Work enquiries. The Hub is inextricability linked to communities in the Scottish Borders through its social and local history collections that document eight centuries of life in the Borders.